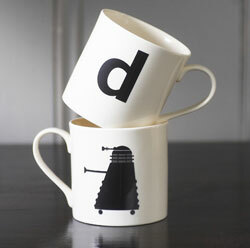 Yes, we’re going on about mugs again – this time it’s the Urban Alphabet half-pint mugs. Each mug in the range has a letter (that’s the alphabet bit), with an image of a familiar, classic or everyday object on the other side (the urban bit). Objects include an angle poise lamp, a bike, a shoe, a teapot a heart and our favourite, a dalek. They’re quality mugs too – hand cast fine English creamware, plenty big enough for your morning cup of tea. Available now, they retail for £11.95 each. and Aria in Islington (although not in their online store).